BRAKE SYSTEM WARNING LIGHT IS ON. 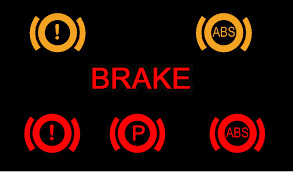 An Illuminated Brake system light could mean the parking brake is on, the brake fluid is low, or there is an issue with the anti-lock braking system (ABS). Check to make sure the parking brake is off and have a professional technician check the brake fluid level and diagnose if there is an ABS issue. Our eliable technicians are here to help. Come on by and we will take care of you, have some chocolate chip cookies on us ! !